Lindsay Erin: Happy Fall Y'all! Wow! It's been waaaay too long! So, it's now fall; time is flying by! Justin and I now have hardwood floors throughout our entire house; they are beautiful. Over Thanksgiving break, I also plan to paint our bathroom off our bedroom. I'm going to see about putting up some chocolate molding and painting the walls khaki. I have been dying to get a sewing machine and a woman from my hometown has recently moved to Wilmington and brought me one she no longer uses! I have to go pick it up, but I am soooo excited to get to work on some fun crafts. I may just want to have another work-less summer. I've really enjoyed decorating the house for the holidays as well; I'm super excited about Christmas around the corner! 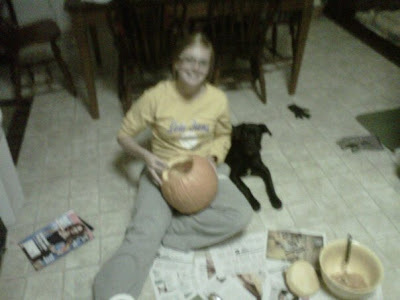 In fact, last night, Irie, Justin, and I carved our first family jack-o-lantern! To feed my crafting appetite, I've become officially addicted to this site I just found called, Tip Junkie. Its a fantastic blog that shares other peoples' craft ideas. I am a big fan and am already stealing some great decorating ideas to use as wedding gifts! Irie is growing bigger and bigger all the time. She is almost to 30 lbs. now. She loves chasing leaves and going for walks. Justin recently took her on her first golf outing. He said she loved riding in the golf cart and was very friendly and considerate when others were hitting their ball. The front 9 she would run along side the cart and the back 9 she wanted to ride she was so tired! I wish we had pictures from it; I'm sure it was adorable. I've got some great new recipes I stole from some friends in PA a few weeks ago that I'm going to try out at Thanksgiving this year. And my friend, Mindy, is sharing peppers, mushrooms, and tomatoes with me from the box that we shared all summer long. So, my next big venture...mushroom risotto. I'll let you know how it turns out and I'll be sure to include pictures of my crafting expeditions!